Firefighters found the victims’ bodies after they extinguished a fire next to the locked room. 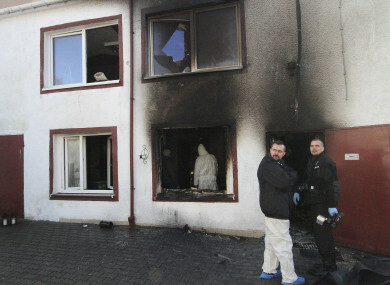 Forensic and other police experts examine the site of a fire in an Escape Room, in Koszalin, northern Poland, yesterday. POLISH OFFICIALS HAVE shut down 13 escape room entertainment sites for safety flaws and the prime minister asked people today to report such lapses to firefighters and police after five teenage girls were killed in a fire. Players in escape room games are locked inside a room or building and must solve puzzles and find clues that lead them to the key that will unlock the door. Regarded as an intellectual challenge, the games are highly popular among teenagers in Poland. Fire chief Leszek Suski said the escape room at a private house in the city of Koszalin, where the 15-year-old girls died Friday locked inside a room celebrating a birthday, had no emergency evacuation route. They were the first known deaths in an escape room, a form of entertainment that has been growing in Poland over the past five years. Autopsies showed that the girls, who were friends from school, died of carbon monoxide inhalation. A young man employed there was hospitalised with burns. Prosecutors say a leaky gas container inside a heater is the most likely cause of the blaze. The 28-year-old who designed and runs the site has been detained and will be questioned, Szymczyk said. His injured employee is also going to be questioned. During a memorial Catholic Mass at Koszalin Cathedral, Bishop Edward Dajczak identified the girls by their first names as Julia, Amelia, Gosia, Karolina and Wiktoria. Public prayers were planned later today in front of the house where they died. Prime Minister Mateusz Morawiecki, along with Suski and Szymczyk, spoke after holding a meeting in which they discussed with other officials ways of improving safety at entertainment venues. Email “Polish officials shut down 13 escape rooms over safety flaws after 5 teenage girls die in fire”. Feedback on “Polish officials shut down 13 escape rooms over safety flaws after 5 teenage girls die in fire”.